Chemicals giant, LyondellBasell Industries N.V. LYB has completed the acquisition of A. Schulman, Inc., a leading global supplier of high-performance plastic compounds, composites and powders. In February, LyondellBasell had agreed to take over A. Schulman. The acquisition is in sync with LyondellBasell’s growth plans and creates substantial value proposition for its customers. The integrated business will operate as a stand-alone Advanced Polymer Solutions business segment, the company noted. The buyout doubles the size of LyondellBasell’s existing compounding business. It also creates a platform for growth with reach into additional high-margin end markets such as automotive, construction materials, electronic goods and packaging. The acquisition creates a premier global provider of advanced polymer solutions with extensive geographic reach, leading technologies and a diverse product portfolio. The company expects to capture $150 million in run-rate cost synergies within two years. The buyout is also expected to be accretive to earnings within the first full year following its closure. 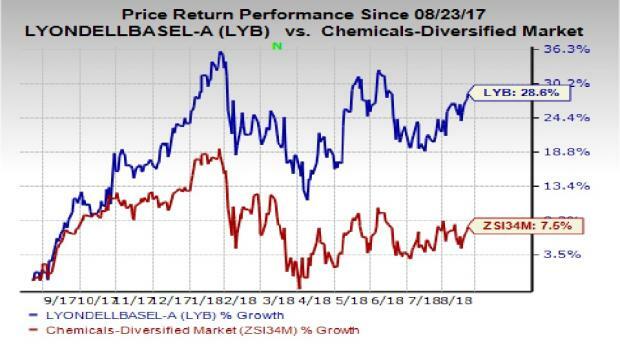 LyondellBasell has outperformed the industry it belongs to in a year’s time. The company’s shares have rallied around 28.6% over this period, compared with the industry’s growth of 7.5%. LyondellBasell stated, during its second-quarter earnings call, that it is well-positioned to boost earnings over the upcoming quarters on the back of operational and market improvements in Refining, strong performance in Intermediates and Derivatives, the A. Schulman buyout and the start-up of Hyperzone HDPE plant in 2019. Earnings are expected to benefit from increased profits in its refinery, which is likely to be driven by the impact of new marine fuel regulations in second-half 2019. LyondellBasell is a Zacks Rank #2 (Buy) stock. Huntsman has an expected long-term earnings growth rate of 8.5% and a Zacks Rank #1 (Strong Buy). The company’s shares have rallied 22.5% in the past year. You can see the complete list of today’s Zacks #1 Rank stocks here. Celanese has an expected long-term earnings growth rate of 10% and a Zacks Rank #1. Its shares have gained 19.2% in a year’s time. Air Products has an expected long-term earnings growth rate of 16.1% and carries a Zacks Rank #2. The stock has rallied 14.4% in a year.